cap is up to 6 cm broad, flying-saucer shaped with a central hump. cap is smooth, tan to light brown. gills are broadly attached to the stem, tan, well-spaced. stem is solid (not hollow) and tough - too tough to break with fingers. It is also very pliant. You should be able to wrap it around your finger without it breaking. grows in grassy areas, meadows and fields, forming rings in the grass. appears in spring, summer or fall. taste is mild and pleasant; cook before eating. warning: avoid specimens growing near highways, which have been exposed to toxic car exhaust compounds. 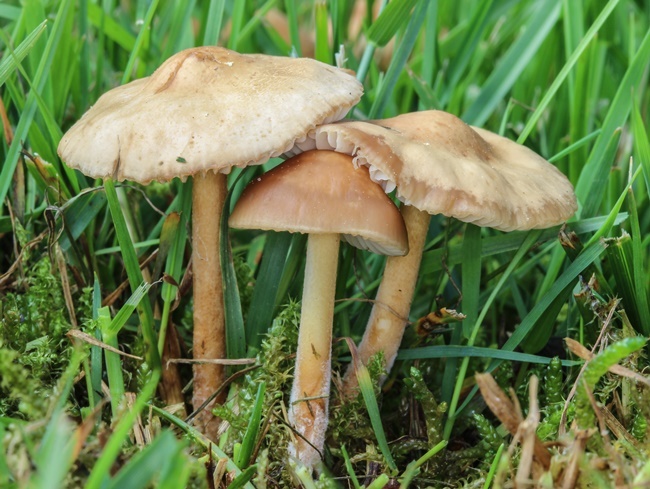 As a city-dweller, you'll likely find this mushroom on lawns after rainy periods, where it grows in rings and often discolors the grass around the perimeter. Other poisonous mushrooms can also form rings on lawns, so be sure to check all the key characteristics. The stem should be solid and remarkably strong. You'll have no trouble pulling up the entire mushroom along with a clump of dirt on the bottom of the stem just by gripping the stem and pulling. The gills should not appear crowded, but rather should be well-spaced and feel a little rubbery. When you smell the mushroom, there may be an odor that is faintly reminiscent of sawdust. I recommend going into the field with scissors for harvesting these mushrooms. Snip the cap off the stem and then cut the cap right in half and check for worm holes in the hump of the cap. These mushrooms freeze well and if you are a fan of their rubbery texture and sweet taste, they are one of the best kept secrets of city foraging.